If you're in the market for a Windows 8 tablet or laptop you'd be remiss to not check out the Lenovo Yoga 11S. Pundits have been predicting the "death of the PC" for more than a decade. Of course, if you looked at the balance sheets of former industry juggernauts as HP and Dell you'd be inclined to think that those prophecies may actually be on the verge of coming true. And then there's Lenovo. While other manufacturers are busy pointing fingers as to why the PC seems to be struggling in the face of competition from that Cupertino-based company and myriad tablets, Lenovo is both pumping out solid Windows 8 devices while at the same time, turning a profit. Which brings us to the Lenovo Yoga 11S. Lenovo is known for making primarily productivity machines for productive people. Its Thinkpad line is known the world over as a no-nonsense, reliable Windows 8 machine. However, the Yoga Lenovo has let its hair down and gotten a little bit playful. A transforming ultrabook in silver or metallic orange with an equally colorful screen, it's just as functional but much "cuter" than what we usually see from Lenovo. Of course, this isn't Lenovo's first time on the yoga mat. The 13-inch Lenovo IdeaPad Yoga was released last year to very favorable reviews. The appropriately named 11s is a size down. At just 11.6-inches, it's the smallest form factor that can support a full QWERTY keyboard. Sporting a rather heavy duty hinge, the flexible Yoga 11S is designed to bend over backwards at a moments notice. You can easily use the Yoga 11S as you would any other laptop, replete with a full QWERTY keyboard. While it's relatively small, we had no problem writing on this keyboard. This review, for instance, was a breeze. That said, we would have appreciated the Yoga 11S having a backlit keyboard. While this is in no way a deal breaker, it's a nice feature when using the laptop in darkened classrooms or meetings. 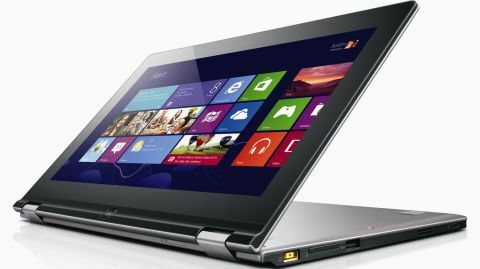 Where the Yoga 11S really shines is the flexibility that that hinge provides. If you want to use the Yoga 11S as a Windows 8 tablet you simply fold the keyboard all the way to the back. In this mode, you're basically just using an 11-inch tablet. Also, since the keys are still exposed in this mode they're disabled. That said, it's still sort of weird to feel them when you're sitting on your couch using the device in tablet mode. In stand mode you can orient the keyboard around 30-degrees from the display, and you can easily stand the Yoga 11S on a table or desk. In our tests we found this mode great for presentations or reading recipes in the kitchen. It's also perfect for watching movies and television shows in bed.